What do you know about goats? 1. They have square pupils. 4. They have cute little hoofie-woofies. 5. They are one of the reasons I legally changed my name when I was 16. And I wanted one. Well, I mean, I wanted one in a vague, distant way, the way that we all want a Lamborghini or backyard yew-hedge labyrinth or a leather bikini. These wants never become a concrete objects, because when you think hard about any of them, you can’t really imagine how, say, a life-size statue of William B. Yeats and John Singer Sargent holding hands would really fit into your current lifestyle. So years passed. Somewhere along the way, I realized that I was now a grown up, and if I wanted to eat cookie dough for breakfast, there was no one to stop me. And also that if I wanted to get goats, I could just get goats. There was only one person who had to agree. ME: I want to get some goats. Now, I don’t know how much you know about goats. But there are a lot of different sorts of goats. There are dairy goats and meat goats. There are goats with ears that stick up and goats with ears that hang down. Horned goats. Unhorned goats. Goats with long hair, goats with curly hair, goats with long and curly hair. Goats that only come in black and white. Goats that only come out of the ocean every November. There are a cornucopia of goat varieties to choose from. A cornucopia. 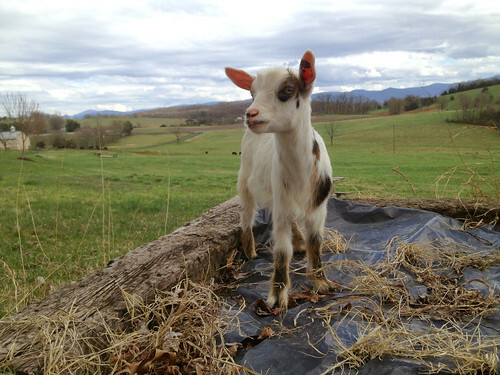 Last Friday, as soon as I got back from tour, I brought home two Miniature Silky Fainting goat kids. That’s a lot of capitalized words, so allow me to break this down for you. They are Miniature. And Silky. And they Faint. Well, they are not really Miniature. Currently, they’re the size of cats, but they’ll get knee-high. Which is small. But not miniature. When I think the word “miniature,” I think — I can put that animal in my pocket. I could store it on a shelf. I could fit 50-60 of them in the back of my car. These goats, on the other hand . . . I could probably only fit 10 of these goats in my backseat. And I’d need Lover to pack them. He’s one of those people who are good at packing cars. And they are not yet Silky. They will be, mind you. Right now they are merely fluffy. But I saw their adult brethren at the Miniature Silky Fainting Goat farm and I have a bottle of conditioner at the ready. Also, about the fainting. Some of you may already know about fainting goats, as they are a bit of an internet sensation. Basically, when you surprise a fainting goat, they fall over. I did a bit of research on this to find out if it was harmful. I knew myself, you see. My dark nature would be torn between allowing my goats a long and healthy life and making my goats fall over every time company came over. Luckily for me, I found out that I didn’t have to choose. 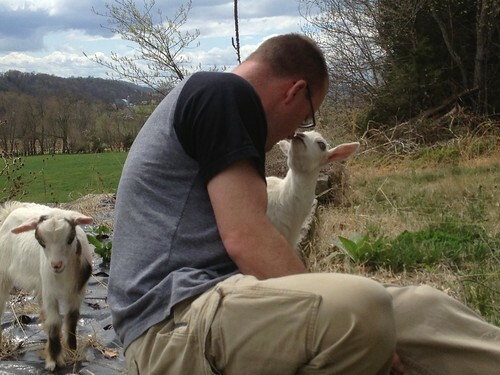 Fainting goats — myotonic goats, really — don’t actually faint. They never lose consciousness. Instead, it’s like when someone honks a horn right by your head and you seize up for a second. Myotonic goats react the same way. Only they seize up for about ten seconds. Which is enough time for them to go completely rigid and fall off a picnic table*. *this is the voice of experience. This is the point where this conversation always goes this way. ME: So basically every time they get surprised or excited, they fall over. EVERYONE: Why would evolution do such a thing? Evolution, although she is a tempestuous mistress at best, cannot be blamed for this. Farmers intentionally bred for fainting, and not just because they knew that hundreds of years later authors would want to have them. Goats are crafty little buggers and masters of escape. Not fainting goats, however. GOAT: I’m escaping! I’m escaping! FAINTING GOAT: I’m escaping! I’m escaping! Because, as I noted, excitement can also make them faint. There’s also some theories that fainting goats were kept among sheep so that when wolves appeared the goats would look up and say OMFG WOLVES where F stands for Faint, and then the sheep would get away while the goat remained behind as lunch. But I think that’s pretty unlikely, seeing them in action. Because it’s really not Peril that makes them faint. It’s Shock. So unless the wolf is rappelling suddenly from a helicopter, the goats will probably just be able to run away like any other normal snack-food-species. Oh, I almost forgot. My favorite part of my research? I discovered that older fainting goats will learn that they faint in shocking circumstances. So when they feel they’re in a stressful situation: they will lean on something. They become Miniature Silky Fainting Self-Aware Goats. I mean, it’s like they invented these animals for me or something. I guess you want pictures? Here are pictures. This is General (the all white one) and Specific (the slightly more adorable one). They love to huggle and follow us around and they also have cute little hoofie-woofies. Here is also a video of Specific chewing.